Day 4 was so much fun! I shot pics in the early afternoon then went to a Reward Style party on the Empire Rooftop where I was staying. I got to meet so many fashion bloggers from all over. Definitely a great time. Then I had a show at night for Emerson at Lincoln Center. When I went shopping for fashion week, I literally went to every store I could think of. I honestly don’t shop much at Macys, but I decided to go there and look. I found this romper and it was only $25! I fell in love with it because it kind of has a vintage vibe with the print. I thought the sheer sleeves made it really different too and I added my favorite heart belt. When I was styled for the Huff Post segment, I was put in a dress with a very similar print 🙂 I’m wearing gold monogram earrings with my N initial and these are now my new every day earrings! I usually wear small earrings like this so these are perfect for me. This bag became my staple piece during fashion week. It was the perfect size and definitely made a statement. These shoes were also the most comfortable pair that I brought, so by day 4, I literally only wanted to wear these! 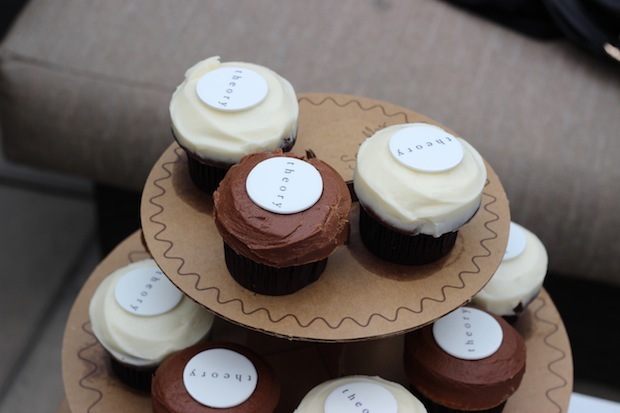 I was going to include these pics in my NYFW Diary but decided to do it for this post instead. 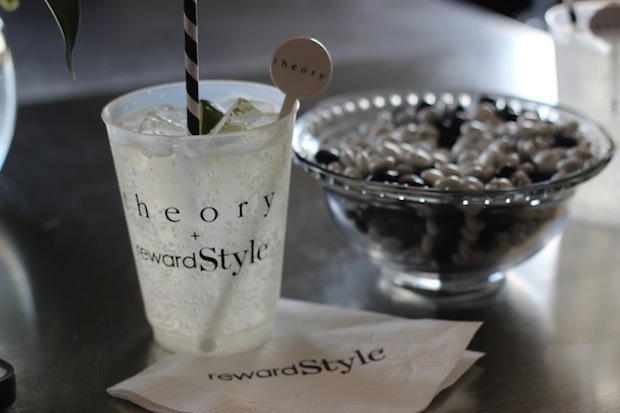 I only got a few snaps at the RS party, but I really had such a great time and met some fab bloggers! 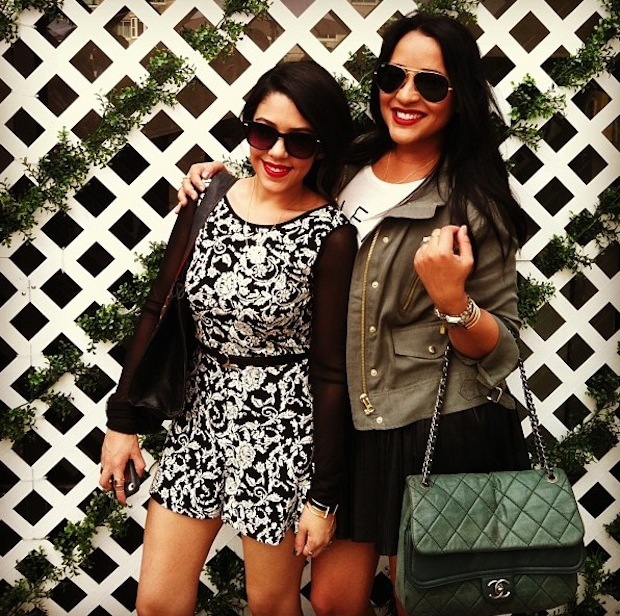 Had so much fun with blogger babe Nashelly from FabuLatina. 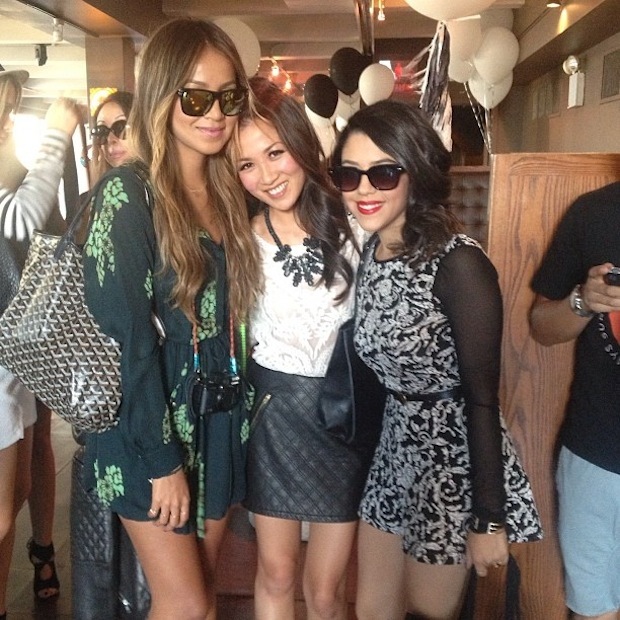 I got to see the lovely Aimee Song from Song Of Style again. I met her for the first time last year at FNO but this time I got to chat with her a little more. She really is so sweet and down to earth. Definitely one of my favorites. I also got to see Julie from Sincerely Jules again. I met her when I went to Miami for the Cotton contest. And I got to meet Wendy from WendysLookBook for the first time! I love her videos and style and she was also so down to earth. They’re both so sweet. Makes me love them that much more! Halfway through NYFW posts! Anxious to post new looks so I might start doubling up on these. I still have my coverage from the shows so I will probably do them all for one post. I seriously have to get back to my youtube videos too, so I am going to try my best and film one this week. Can't believe that romper was $25 bucks, its so cute. So killer , i think you having the time of your life babe;enjoy…xoxo!! Amazing outfit. Looks like you had a great time. I'm so evious! Love your blog. Gorgeous as always. Great post. Looks amazing! Love love love that romper! i hope to meet them one day! ill def be at FW next year! great post again Nat! Love how the arms of the romper are sheer and the lips add color:) I love your blog, and theirs too! Love how you guys can all get together, looks like so much fun!